Grandsons John and Andrew love stories and games that feature robots. We’ve played through Machinarium, a great computer game about a city of robots. Machinarium (see the November 2009 post) is long enough to tell a good story, full of fun problems-to-solve, but can hold the rapt attention of a four and five-year old when played with an adult (like a grandfather or grandmother). Every night, for two weeks, I played through Machinarium as John and Andrew's bedtime story. There are hundreds of web-based games and I keep my eye out for those that I would like all of our grand kids to know about and, if they choose, play. I recently found a game that features a robot so this post is especially for John and Andrew (and any other grandparents, parents, or teachers) that appreciate good interactive stories). The bolt of lightning that struck Patrol Tower #2 provided Little Wheel with enough juice to get moving on solving the problem of restoring electrical power to all of the robots in the city. The problems Little Wheel has to solve to restore electrical power are not difficult but do require the player to pay 'attention to detail', which is an important problem-solving skill. As a new level is reached, a series of white circles appear that identify where on the screen an action is required to move the story forward. The white circles eliminate the need to click all over the screen to find 'hot points'. In the following short, one-minute video, I show how to use the white circles to solve Little Wheel's first problem, calling an elevator. 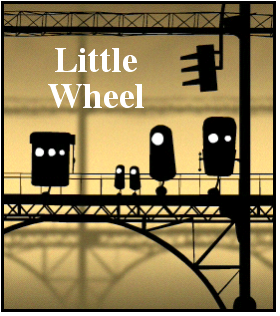 Little Wheel is a short game and is designed to be played through in a single session. There is not a 'SAVE GAME' button so don't look for one. To play the game, go to either of these sites. Have fun.